Flying on an airplane always gives me a rush, especially when the plane is heading toward the Galápagos. Without fail, the view of turquoise seas and lava rock-edged islands as we descend causes my heart rate to pick up. I’ve had the opportunity to travel to the Galápagos Islands six separate occasions – six round trip flights between North Carolina and the archipelago – as a part of my PhD research at Wake Forest University. To reach the field site on Isla Española, we take a plane, bus, taxi, and boat – all burning carbon-rich fuel, increasing my carbon footprint tremendously. Although I travel to the Galápagos for research, in many ways I’m still a tourist: I’m not a permanent resident of the archipelago and I buy food from restaurants and souvenirs from local shops, much like a tourist. Protected areas across the globe, like the Galápagos Islands, receive an estimated eight billion tourists each year and tourism is predicted to increase at a rate of 4 percent annually. A new study in Nature Climate Change calculated how tourism increases greenhouse gases that cause climate change; it found that tourism accounts for 8 percent of greenhouse gas emissions, with transportation, shopping, and food consumption being the biggest factors. Unsurprisingly, tourism’s carbon footprint increases with increasing disposable income: The US has the greatest disposable income and the largest carbon footprint. Tourism is predicted to increase more than any other economic sector, particularly as the demand for exotic adventures surges. Tourism can provide a huge economic boost local economies, but it can also harm local culture and environment, and contribute to climate change. Should we stop traveling altogether? When I tell people where I work, they often exclaim “I would love to visit there someday,” and some have ask if tourism has ruined the Galápagos. I wondered, though the enchanted islands have undeniably changed since Darwin first visited in 1835, could there be any truth to this question? After 1979, when the Galápagos were designated a UNESCO World Heritage Site, the number of tourists visiting the Galápagos increased to an unsustainable rate – the Galápagos National Park Directorate wasn’t prepared to handle so many visitors. In 2007, the archipelago was placed on the UN’s list of endangered Word Heritage sites, but changes in biosecurity measures and conservation efforts resulted in its removal in 2010. Tourism to any place like the Galápagos is a balancing act of benefits and harms, which every visitor should keep in mind before traveling. The Galápagos National Park protects 97 percent of the islands; humans (residents and agricultural activity) only occupy 3 percent of the archipelago. Visitors can buy local milk, cheese, and produce meaning those goods don’t have to bee imported to the islands (using carbon-rich fuel) from continental Ecuador. The Galápagos National Park Directorate limits the number of visitors to specific tourist-approved sites. For example, Bahía Gardiner at Isla Española can only have, at most, four cruise boats at a time. The park coordinates with approved tour operators on these logistics to minimize the human effect on the local plants and animals. The park asks all visitors to abide by 14 rules, such as not feeding the wildlife, which can cause health problems or a dependence on human food, and remaining on marked trails to prevent erosion and vegetation disturbance. Goods taken to the Galápagos must go through a quarantine process; for instance when crews on passenger planes, mid-flight, open overhead storage spaces and spray a pesticide to kill non-native insects. Before departing for our study site, we clean every bit of equipment, put the gear in sealed containers sprayed with insecticide, and leave it in a quarantine facility for 48 hours. Accidentally transferring an invasive species to an island could be devastating to the seabirds we study, and any number of other species. Local businesses, Galápagos residents, and conservation organizations, like Galápagos Conservation Trust, are working hard to make the archipelago plastic pollution-free. Stores no longer offer plastic bags – you need a reusable one – and many restaurants are going straw-free. Recycling is mandatory and residents have been fined for failing to recycle appropriately. Tourism creates huge economic benefits. Visitors to the Galápagos pay a mandatory $100 fee upon arrival, with the majority of the fee going to support the Galápagos National Park. Approximately 70% of the archipelago’s economy stems from tourism-related activities, and many of the 25,000 legal residents work in the industry as restaurant and hotel staff, taxi drivers, and national park guides. Today, more than 200,000 tourists annually visit the Galápagos, bringing the risks of new invasive species. More 866 non-native plant species have already been introduced across the archipelago. Most of these species sneak in accidentally – a seed stuck to a tourist’s sock or riding on a cargo ship might grow into a plant that can take over a landscape. Some were introduced as food crops, like the blackberry plant that now covers approximately 12% of the archipelago. Small insects and seeds can be difficult to prevent from entering the archipelago, even with the biosecurity measures. Organizations, like the Galápagos Conservancy, are helping to fund the development of effective control techniques for invasive species. While the rules laid out by the park are good and very important, they can be difficult to enforce. One of the most innocent rules to break: respect the two-meter (six-feet) distance from the wildlife. Animals on the Galápagos Islands evolved with no predators, making them appear “tame” and easy to approach. It’s natural, at first sight of a large Galápagos tortoise, to want to step closer. But animals can be sensitive to our presence in imperceptible ways, like increasing stress hormone levels or metabolic rate. Seabirds in the Galápagos, for instance, avoid nesting close to tourist trails. Respecting these rules is crucial and sometimes overlooked, depending on the guide and tour. I love travel, and exploring a country can change your life – it was a semester studying abroad that directly shaped my professional path. Given my experiences and the travel necessary for work, I’m in no position to call a halt to traveling, but I hope that we can be good travelers. Though tourism and global travel can have negative consequences on the environment, we can easily start to reduce these effects. Research your destination ahead of time. Are sustainable tourism practices already in place? Consider choosing an environmentally friendly tour operator, or tour operators that give a portion of proceeds toward research or conservation. For example, Ecoventura, a tour operator in the Galápagos, will donate a portion of cabin sales to the Charles Darwin Foundation and Galápagos National Park. Reduce single-use plastic. Reusable water bottles and small reusable bags brought from home can help a lot. Avoid disposable plastic straws, which only get added to landfills, and check out alternatives that you can stick into a backpack easily. Eat at local restaurants and ask where the fresh fish or produce originates. Choose to eat at restaurants that serve seafood caught in-season, not illegally harvested. Shop at local stores, especially those selling products made from local artisans. Give careful thought to your souvenir purchases. Local shops in the Galápagos sell beautiful black lava and red coral jewelry – illegal when harvested from the Galápagos. When asked about the origin, the stores will say that they don’t come from the Galápagos; regardless of the origin, harvesting rare parts of nature is unsustainable. Be a considerate photographer. In the rush of the moment, it can be easy to forget where you are and try to get closer for a “more perfect” photo. Keep in mind that if you step off the path, you might cause an animal harm, damage small plants, cause erosion, or hurt yourself. If possible, give back to the area you visit. Conservation organizations gladly accept donations. Participate in the local conservation organization’s annual photo contest – it helps provide them with an endless number of promotional photographs. Consider staying more local. Explore a state or national park closer to home. Since teleporting to destinations isn’t yet an option, transportation-related tourism will continue to be a huge contributor to carbon emissions. But we can make some changes to what we do at our destination to be better tourists. If we keep in mind how our travels affect local communities, we can leave these natural areas in a beautiful state for generations to enjoy. In 2015, the United Nations adopted a milestone resolution, recognizing sustainable tourism as the key tool for eradicating world poverty and protecting biodiversity and the natural environment. These values are at the core of EarthTreks’ business model, as we strive to be sustainable in as many ways we can, from our office practices in Canada to being both ecologically and socially responsible in all aspects of both our group and independent trips through Ecuador and the Galapagos Islands, as well as all other offerings. When talking about sustainable travel – in an effort to make this concept as easy to understand as possible – we define sustainable simply as “EVERYONE WINS”. The people and cultures we interact with, the locally owned restaurants and hotels we eat and stay at, our clients, and the natural environment. Our hope is to reconnect our wonderful clients with the beautiful people and nature in Ecuador, helping empower them to be champions for their protection. Tourism industry is flourishing now more than ever. With industries and brands expanding worldwide, and the aviation industry making it possible for us to travel around the world in the blink of an eye, the world almost seems to fit into our palms. Thanks to the increased buying powers and falling travel costs, vacationing has become something that everyone likes to indulge in. Sometimes, it is not just the need for a break from our mundane lives that takes us to places. Nowadays even business meetings involve travel. After all, we all just need a reason to get packing. Tourism has come to be seen as an significant economic contributor that several countries rely on for revenues. It is the world’s biggest employer, providing jobs for one out of 11 workers. However, the increase in demand for tourism has also has caused it share of problems such as social dislocation, loss of cultural heritage, economic dependence and ecological degradation. Often tourists tend to forget that the right to travel comes with a degree of responsibility. Those who have already had this awakening are now promoting a concept called ‘sustainable tourism’. ‘Tourism that respects the locals, travellers, the cultural heritage and environment’ is sustainable tourism. Of course, this would be a whole lot more feasible if the government took steps to enrich local community and protecting their ecosystem while promoing tourism. Unfortunately, there are very few governments that have made this effort. However, when you are planning your next vacation, remember that it is futile to wait for the world to change and plan your holiday accordingly. Ecotourism simply means responsible travel that conserves the environment, preserves the well-being of the local people and also gives ground for learning and education. On the other hand, sustainable tourism is tourism development with a balance between environment, economic and socio-cultural aspects. You could say that ecotourism is a part of sustainable tourism. To sum up the difference between the two; sustainable tourism does not end with geothermal-powered hotels, conservation efforts, and companies concerned with their carbon footprints. It is rather much more than the need to be ‘eco-friendly’, but to be responsible to the local people and the community. The choice we make while traveling and the steps we take to ensure the need to be responsible not only to our bank balances but to the local surroundings of the area is essential. We need a world, a healthy world at that, for us and the generations to follow. There’s sustainable and unsustainable tourism. The former is when everyone involved is benefited while the latter is when only the traveller is, leaving the host community with no gains. The tourism industry is booming and there seems to be no stopping it. If we need a destination to go to tomorrow, we need to be more responsible today. Remember that your actions would destroy the place you love so much. The need to preserve the local community not only benefits the community but also gives the tourists an authentic local experience. Luxury hotels are without a doubt the must-have for the lavish holiday we need. Since it is important for you to be pampered, make it a point to check up on the hotels and their ways of functioning. Most high end hotels don’t take necessary measures to be more sustainably committed. However, there are many eco-friendly hotels coming up and its always easy to find their practices on their websites. Places that are hosted on Airbnb and other home stays are always a great option to check out. Also, many of them provide the in-house pampering you crave for, while making environmentally sound choices. These stay options will also help you get a local experience. Many provide you with the best options (read: low-key, underrated, authentic experiences) to check out rather than just the popular spots. Uou will get to know the local residents, meet new neighbours and experience the authentic life of the place. When we travel to a new place we meet new people. When we make an effort to learn about the local culture and their way of life we build a relationship with them. Its always good to take a look at the place from a local point of view. Guides may help, but the real stories come from the people themselves. Some may shy away, but you would surprised with the number of people who would love to tell their stories and show you around. With great pride and happiness they will give you a whole new meaning to your holiday. Who knows, these relationships maybe the ones you cherish for a lifetime. Reach out and make friends. While planning your trip and jotting down the sites to see, the things to do, its always good to check out the local community. Every place will have volunteering programs that you could join. This would be a great way to gather knowledge, but also share what you have to give. In many areas local schools have volunteering programs or you could help with the community events. This could help burst the little bubble we live in back home. We learn more than what we’ve been told. We see that a place is more than its stereotypes and hot spots. There are different causes to get involved in while travelling that would encourage many others to follow. By involving ourselves in the community its not only helps them, but also gives us a new perspective. Local cuisines are an attraction. It is always best to eat at a restaurant that sources locally rather than the popular tourist hotel. You will be able to enjoy the authentic flavours of the place. There will be farmers markets, street food stands, and cafes that will give you the best experience. Eating from places that source food locally will help local business survive. Its a great road to take to eat green and go green. Shopping is a part of everyone’s travel. Rather than the malls and the markets that are geared to tourists, theres always an option to find local flea markets and local vendors. This will give you legitimate products and make your spending worthwhile. Taxis are always a lazy option for us. Its an easy way through the unfamiliar city. But what’s a holiday with no adventure? The local trains, the buses, cycles and even walking are great ways to experience the place. Not only are we helping save fuel and emissions of poisonous gases, we are experiencing the place in a slow pace. Walk through a big city- we see the big buildings, the hustle and bustle, the rush to work, the happy faces after work, the musician on the street, the sunset, the tiny cafe that would have been invisible if you had to drive by. We may find a new story if we just go out to walk. We often tend to pack a large suitcase for a short stay. After all, we need to bring out the best dresses, shoes, accessories and the list can be endless. However, packing light is always better for you and the environment. Firstly, you wouldn’t have the burden of lugging around your heavy suitcase. Secondly, heavy luggage is stressful to the environment as well, as it requires more fuel to be pushed around. Carry items that can be easily washed, suitable for your trip and you are good to go. And of course, this is a great excise for you to shop more, guilt free. Just like checking in on the hotel’s sustainable practices, it is necessary to look through the practices of the excursion companies. These companies are often cost a good amount, but don’t always provide the full experience. It is your right (and duty) to be aware of the services they provide. The beaches, the wildlife and the beautiful landscapes that they take us to should be maintained, so do not be afraid to ask about their eco-friendly practices. Sustainable tourism is all about making the right choices. We need to appreciate the natural resources and the landscapes of the places we visit. Being apart of the world leaves you with the responsibility to care for a place like your own. Avoid plastic as much as possible or take measures to ensure that they are recyclable. Don’t litter your room or your surroundings. It might mean that sometimes you have to carry around an empty bottle for a while, but ensure that your garbage is dumped in its appropriate place. Take along environmentally friendly products- sun creams, soaps deodorants. The initiate to go green is necessary to save our mother nature. From Alaska to see the American bear, to Azores to witness the whales and dolphins, the great barrier reefs, the beautiful temple of Angkor Wat of Cambodia, or even to Kenya’s Maasai Mara, there are so many places to see and experiences to have. The world has so much to offer and it would be a shame if it all got destroyed because we couldn’t care less. These places need to be there for many more people to visit, so that they can recognize the wonders of the world and experience different cultures and communities. As the people of today we need to make it our duty to be responsible, to care for others and to save each others communities for centuries to come. EarthTreks Strives to be Environmentally Responsible in Canada & Ecuador – One Way is by Being Bullfrog Powered! EarthTreks tries to make every effort to run our business in environmentally responsible ways. That always starts with reduction – energy, paper, garbage, etc. It also includes using hotels and restaurants on our tours that are locally owned rather than international chains, sourcing local products, and likewise working to incorporate environmentally responsible practices in their day-to-day business, such as offering water for bottles to be refilled. This year, as we celebrate the 150th anniversary of Canadian confederation, we are proud to reflect on what the bullfrogpowered community has accomplished together throughout the years. We continue to increase the amount of green electricity and green natural gas on our energy systems, we support the development of new, community-based green energy projects across the country, and we make our country a better place together through our leadership and collective determination to transition Canada to a low-carbon future. The 2016 Green Energy Audit Report, produced by Deloitte, can be found here. For the first time, in addition to green electricity and green natural gas, the Audit also includes Bullfrog’s new green fuel product, which was publicly launched in the fall of 2016. With the addition of this new product to Bullfrog’s existing portfolio, customers are now able to address all of their energy-related greenhouse gas emissions in one comprehensive green energy solution. In addition to sourcing green energy from across the country on behalf of our customers, Bullfrog Power has been able to contribute financial support toward the development of 115 community-based renewable energy projects. Projects that received financing last year include a solar power system with the Kanaka Bar Indian Band in B.C. and a solar installation on the Kew Beach Public School. We also provided funding to Newfoundland-based Iron & Earth East, an oil sands worker-led group pushing for green energy investments and renewables training for traditional energy sector employees who are out of work. Our annual contributions to community green energy projects across Canada, including the type and province of the projects. Thank you again for your commitment to green energy and for continuing to demonstrate environmental leadership among your customers, clients and communities. If you have any questions about our Audit, call our toll-free number at 1.877.360.3464 or contact me directly at anthony.santilli@bullfrogpower.com. In Ecuador, the official currency is the U.S. dollar. Coins from both countries are identical in shape, size and value and are used interchangeably – however the Ecuadorian coins have Ecuadorian leaders on them. It is wise to take some cash – as much as you are comfortable carrying. Be advised that most businesses will not cash or accept $100 bills. Sometimes it’s even challenging to cash a $50 bill. We will figure this out as we move along if you prefer to travel with a smaller number of big bills (by cashing them at banks). It’s just easier to use smaller denominations. I would advise ordering $USD from your bank at least a week in advance. They might have it if you just drop in, but they might not. Make sure that your PIN is only FOUR (4) digits, as this can present problems with many ATMs (in many countries). This is easy to change right at your bank ATM. Also be sure any card you plan to use has a ‘Cirrus’ or ‘PLUS’ symbol on it. Although ATMs are an easy way to get cash in Ecuador, be aware that the bank in your home country will likely charge a fee of $5 or more every time you use an ATM, even if you are just checking your balance. The daily cap to withdraw money at ATMs is generally $500 USD. Avoid travelers’ cheques – they are often difficult to exchange, even in major cities. VISA, MasterCard, American Express, and Diner’s Club are the most widely recognized cards in Ecuador. Plastic is useful for purchases in hotels, shops, restaurants, and for cash advances from ATMs. Some banks still like you to let them know where you are traveling, to prevent your cards being frozen. You might want to check on this before you leave. You might also want to raise the limit on your cards (daily limit for bank card) before getting on the plane, so you have extra funds available as needed. Pack well – it’s worth taking the time. If you don’t use something at home, you likely won’t need it when you’re away. Pack as lightly as you can, while at the same time making sure you don’t forget any of the essentials for your trip, such sun block, any medications you may need or a good book. Consider what might make your trip more comfortable, such as ear plugs, a quick dry towel or a reusable water bottle. Pack clothes that are comfortable and multi-purpose (noting that white is often best to avoid when traveling, particularly when going to off-the-beaten-path places). It’s always wise to pack things that don’t wrinkle easily. Last but not least, leave anything expensive or sentimental for you – that you don’t absolutely need – at home. Better safe than sorry. If your itinerary includes the Amazon, you will want long sleeves and long pants for our outings – preferably cotton or “wick away”, to help keep you from overheating. Avoid any “sunscreen” clothing – it does not breathe and can cause serious heat exhaustion. If in doubt, don’t hesitate to contact: info@earthtreks.ca. Quito Wins World Travel Award – 2016 Leading Destination in Latin America! If Latin America is on your travel radar this year, you might want to check out the results of the World Travel Awards Latin America 2016 which named Quito, Ecuador the region’s leading destination for the fourth year in a row and Medellin, Colombia the region’s leading city break destination. At a gala event over the weekend in Lima, Peru, the winners of the event’s 23rd edition were announced, identifying the best airlines, hotels and destinations in Mexico, South and Central America for 2016. For the fourth year in a row, the Ecuadorian capital of Quito took the coveted title of South America’s leading destination over fellow nominees such as Buenos Aires, Galapagos Islands, Lima and Sao Paulo, Brazil. Perched 2,850 meters (9,350 feet) above sea level on the ruins of an ancient Inca city, Quito boasts one of the best-preserved historic centers in Latin America. Surrounding areas include snow-capped mountains, tropical rainforests, lakes, lagoons, volcanoes and cloud forests within striking distance of the city. We are very excited to be taking Barrie Chamber members on not one, but two trips this coming winter! The first one departs Canada on Saturday, January 28th – an 11-Day Trip through Ecuador – our specialty. We will be there to meet the group as they arrive in Quito’s brand new Canadian-designed airport. We will then spend a few days touring around the capital – the first city in the world to be named a UNESCO World Heritage Site. It’s absolutely beautiful. Next we will traverse up over the Andes and down into the Amazon basin to stay with an Indigenous community there – a Kichwa community, to be more specific. This will be a fascinating opportunity to learn all about the Kichwa culture and traditions, and will provide us with an opportunity to experience the biodiversity in the jungle first-hand. Then we will move onto the spa town of Baňos, which is full of international dining options, so many different kinds of activities, and medicinal hot springs. After Baňos, we move onto the cloud forests of Mindo where we will go on a butterfly garden tour, chocolate tour, and deep nature excursions, including through EarthTreks’ reforestation project. We will also venture into the artisan markets of Otavalo. The Chamber’s 8-Day Trip through the Galapagos Islands leaves right after the trip through mainland Ecuador (and there is a discount if doing both trips together). We will be staying on two different islands – which is a different (and in our opinion, superior ) way to experience the islands. It allows more time to do what you like, such as snorkeling. It gives you the unique opportunity to get to know the culture of the Galapagos. It allows you more time with the wild and wacky animals that can be seen everywhere. And it is also more environmentally friendly. As is the rule on the Galapagos, we will be with a certified Galapagos National Parks guide for the duration of the trip, as well as EarthTreks’ Founder, Alison Braun. We will time with many of the unique animals the archipelago is famous for – such as the Giant Tortoises we will be visiting a breeding centre. It is nothing short of amazing to see how these giants start out as tiny little babies that can fit in the palm of your hand! Seeing Galapagos Marine Iguanas – the world’s only marine lizard – is another amazing creature we will see lots of. Swimming with the Galapagos Green Turtle may be one of the highlights of this trip though. Then again, there are so many! Some non-animal exploring we will do is a visit to the Charles Darwin Research Station, and we will also go for a hike up and around the second largest volcanic crater in the world. CONTACT US for more information about either or both of these trips, or to ask questions. We are always happy to talk about Ecuador & the Galapagos! You may choose also to WATCH A VIDEO ABOUT BOTH TRIPS to get a feel for some of the sites we will see along the way. Why is Quito, a city that 20 years ago was a pretty-much overlooked South American destination, on so many bucket lists right now? High in the Andes, and built on the foundations of an ancient Inca city, Quito is renowned for Spanish-colonial buildings dating back more than 500 years; not surprisingly, it’s the first UNESCO World Heritage Site capital city, and is now recognized as “Best Leading Destination in South America” by the World Travel Awards (2013 & 2014). Quito offers quirky surprises; it’s the capital city located closest to the sun, at 9,350 feet above sea level. (Keep this in mind if you have altitude problems, and bring sunscreen.) It’s also the only place in the world where you can put one foot in the Northern Hemisphere and the other one in the Southern Hemisphere … at the same time! You can feel the pure energy of the center of the world while you walk the Equatorial line, an imaginary line drawn by the Geodesic French Mission in the 18th century. The Centro Historico merges the daily life of traders, religious people and public servants with visitors from all over. The Quito historic center is considered the biggest and best conserved in Latin America. Among the most recognized sites: Palacio Carondelet; La Compañía de Jesús, a Baroque-style cathedral; La Plaza Grande; the religious complex of San Francisco; and La Ronda, a street with diverse workshops and traditional trade. Popular dishes include mestizos (a mix of pre-Columbian and Spanish), Andean and Iberian: locro de papas, seco de chivo, fritada, empanadas, envuelto (wraps: corn dough wrapped in leaves and cooked in steam), aji sauce, fruit juice and paila ice cream. Enjoy this menu in high-end restaurants and typical market. 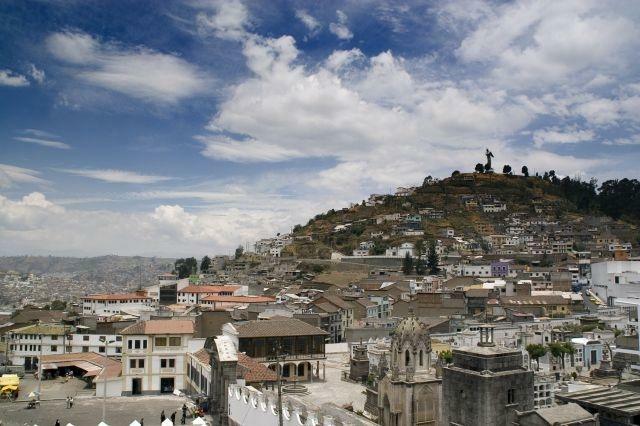 During the Spanish-colonial period, Quito was an important cultural and artistic center. Today, artisans preserve their trade: traditional hairdressers, tailors, hat crafters, herbalists, among artists like Oswaldo Viteri, Oswaldo Guayasamín, Luigi Stonornaiolo or Eduardo Kingman. Each have workshops, with the owners available to talk about their work and their lives. The City Museum, “El Alabado” House Museum (with an extraordinary collection of pre-Columbian art), the Sucre Museum, Contemporary Art Center and the House of Music are must-sees. And for the kids, Yaku Park Water Museum, the Interactive and Science Museum and the Train Museum will keep them busy. In the Mariscal, La Floresta, Guapulo or La Carolina neighborhoods, you’ll find restaurants, coffee shops, and bars and nightclubs with local entertainment typical of Equador. From the popular Chimbacalle neighborhood to the south of the city, climb aboard on what was described as “the toughest railroad of the world” from the beginning of the 20thcentury, when Ecuador connected the coast and the Andes with this impressive work of engineering. Today visit the station, its museum — and take a ride. Shopping malls include “El Quicentro Shopping” or mall “El Jardín” with local and international brands. In La Floresta or La Mariscal neighborhoods you’ll find stores and galleries with contemporary design; in the Centro Historico, specialized art craft stores that include El Quinde. On weekends at El Ejido park, sculptures and more; at La Mariscal, galleries and antiques shops. Just an hour from downtown, at Los Andes Paramo, enjoy hot springs, horseback riding, hiking, and agritourism. In the north-western zone, the cloud forest offers birdwatching, with more than 500 species. Spot the quinde or hummingbirds, and perhaps the Andean bear, a unique South America species. Quito alone is a special destination, but because of its strategic location and well developed tourist infrastructure, it’s also the departure point for Ecuador’s main tourist destinations. You can depart from here to the Pacific Coast with beaches, fisherman´s towns and great gastronomy; to Los Andes with the path of volcanoes that amused Alexander Von Humboldt; to the Amazonia with its extraordinary vegetation and ancestral towns. And off course, to the Galapagos Islands. Just be sure to leave enough time to savor Quito. EarthTreks’ 16-Day Cross-Country Trek has added Cayambe as an additional destination on the itinerary, to take in some sites in that picturesque area, including the incredible rose and flower gardens growing there! This is a great article recently published on those very gardens. You might think of Ecuador as an ultimate “banana republic” by victim of being the world’s biggest exporter of bananas, but over the past two decades it has become famous for a rather more fragrant crop. Ecuador is the world’s third-largest exporter of cut flowers, 73 per cent of which are roses. It is an industry that employed 103,000 people and generated $837m of business in 2013. The growth of Ecuador’s floriculture industry was kick-started in 1991 by the Andean Trade Preference Act, brought in by the US to promote legal industries such as flower growing as alternatives to drug trafficking in four Andean countries: Bolivia, Colombia, Ecuador and Peru. By the time the programme expired in 2013, the industry was well-established in both Colombia and Ecuador, also aided by preferential trade agreements with the EU. In the early years, rapid growth was accompanied by criticism of the wages and working conditions of flower workers, but after a lot of labour unrest, the industry has cleaned up its act. Regulations covering the use of chemical pesticides are much more strictly enforced and today Ecuador has one of the highest minimum wages in the region; it currently stands at $354 per month, almost $100 higher than that of Columbia, its biggest South American rival in the flower business. In a spin-off from the improvements in working practices and conditions, Ecuadorean rose plantations have now become visitor attractions. I toured BellaRosa, a large plantation in a former hacienda close to Cayambe, a huge volcano that dominates the region. It receives about 100 organised visits every year, ranging from parties of tourists to groups from local embassies. Growth has been rapid. BellaRosa began commercial cultivation in 1996 with four hectares of roses. Today the plantation has 31 hectares and 320 workers. Its flowers are grown in vast, silent polytunnels, then taken to a much noisier processing facility where they are sorted, graded and bunched before being shipped off in refrigerated trucks to destinations around the world. On average the plantation produces 90,000 roses per day, but in peak periods that number can double. The process does involve chemical treatments, but plants are also sprayed with natural insecticides made from garlic and chillies. Rows of mint, another natural pest repellent, are planted in the growing sheds. Like many local plantations, BellaRosa specialises in the premium long-stemmed varieties with large heads that are particularly prized in Russia. The signs dotted around the reception area are in both Spanish and Cyrillic script to guide Russian buyers and visitors around the plantation. Traditionally, the US has been the biggest market for Ecuador’s flowers, accounting for 88 per cent of exports in 1990. Today that figure has fallen to 41 per cent and Russian exports have increased to 23 per cent. Whereas US supermarkets and their customers prefer shorter flowers, Russian consumers like large roses of between 90cm and 100cm, which can cost significantly more. Or at least, they used to. The recent economic crisis in Russia, prompted by the fall in oil prices and sanctions over Ukraine, has had a significant impact on the Ecuadorean rose industry. In the second half of 2014, exports to Russia fell 30 per cent in value, and 26 per cent by volume. To add to Ecuador’s problems, other equatorial countries are rapidly developing their own industries. De Ruiter has plantations in both South America and Africa and, as Ad van Rooijen explains, the contrast is stark. “Africa is booming, particularly Kenya but also Zimbabwe and Uganda. In Kenya the plantations are going to higher and higher altitudes so you can grow the same long-stemmed varieties as they do in South America, and of course Africa is much closer to the big markets of Europe and eastern Europe,” he says. Ecuadorean plantations are now attempting to reorientate themselves to the US market and its preference for shorter, cheaper roses, but it takes time to replant. At the moment, the lorryloads of roses are still trundling down Ecuador’s highways, but the Russian market offers little to be optimistic about. On International Women’s Day, March 8, which is traditionally the most important date in the calendar for sales to Russia, exports from Ecuador were down 16 per cent. Whether the signs on the BellaRosa plantation will soon change from Russian to English remains to be seen.